Koller: "We are designing new architectures and interfaces for drivers to enable them to use the extra time they will have in their cars." Faurecia is looking to grow through acquisitions following the recent sale of its exterior parts business. It is particularly interested in solutions that improve the human-machine interface because its knows that autonomous driving will dramatically change vehicle interiors. The French supplier’s answer to this challenge is the “cockpit of the future.” Patrick Koller, who became Faurecia CEO earlier this year, provided details to Automotive News Europe Correspondent Bruce Gain. What are the key challenges Faurecia faces related to meeting the forthcoming demand of autonomous driving? Autonomous driving will shape what we call the "cockpit of the future." We are designing new architectures and interfaces for drivers to enable them to use the extra time they will have in their cars. 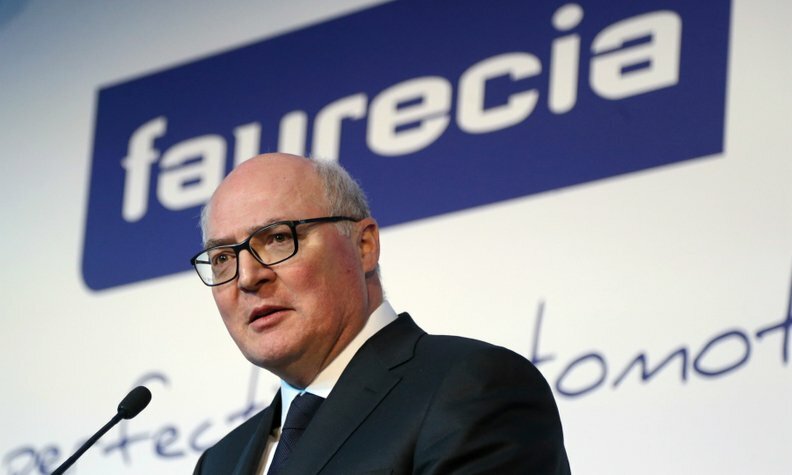 Is Faurecia looking to add technologies through acquisitions? Since we sold our exterior parts business and will be debt free or close to debt free by the end of this year, we will be in the position to make acquisitions. We are clearly looking to add technologies to our portfolio. These include whatever is linked to HMI [human-machine interface] and how you integrate that into the cockpit of the future. How will safety and comfort factor into your cockpit of the future? There are two areas consumers will never compromise on: safety and comfort. During the initial period when autonomous cars are adopted, most other cars will not have autonomous driving capabilities. The two will exist together. Safety, of course, is absolutely critical. Drivers must always be able to take back control of the car. But with less driving to do, motorists will require, for example, larger screens that can also be removed and put away. There will be a much wider range of seat positions, such as being able to fold them back more in a reclining position as you relax or even sleep in your car as it drives itself. We are developing new interior architectures to accommodate this change. This includes the position of seat belts when you are reclining, the way the airbags are activated in case of a collision and the direction of air conditioning and heat flow. As you let the car do more of the driving, for example, you might want to read. To do that, we need to adjust the position of the arm rests and lighting so that you can read more comfortably. All these things need to be taken into consideration. MAIN CHALLENGE: Keeping pace with automakers' requirements for cutting-edge technology. What role will connectivity play? Autonomous cars, of course, will be connected. Drivers and passengers will increasingly demand the same level of connectivity in their cars as they have at home as they bring their consumer devices into the car with them. For example, the HMI we are developing must become more predictive. It will need to recognize who is in the car and to instantly recognize what their preferred applications are. The choice of available applications and settings will be so vast that it will be difficult for individuals to choose, so the HMI will need to propose choices. Well-being is also a key factor for the cockpit of tomorrow. The idea is that people will leave their cars in better shape than when they entered. They want to relax during their trip in a pleasant atmosphere. How high will the demand be for autonomous cars in the future? Their volumes will be significant: above 5 percent by 2030. Where else are you looking to make acquisitions? We are also looking to invest in lightweight solutions. You are starting to see premium carmakers use lightweight composites on a greater scale. Due to stricter emission regulations, all carmakers will need to consider lower car weight as a priority. We are also looking at energy recovery systems and efficient emissions control devices and fuel cells. How is Faurecia positioned in the marketplace? We have never been in a situation like this before in the car industry. There are very big changes happening. The first is alternative powertrains. The second is whatever is linked to connectivity. This includes, of course, autonomous driving. The third is new business models, which will likely create new customers for us, such as from car-sharing firms, which are certainly not threats. They represent great opportunities. In 2013, we told the market we wanted to achieve our turnaround as a company by 2016. I think we have succeeded. We already achieved the vast majority of performance metrics we outlined. These metrics include operating income, growth, cash flow, and return on capital. We have completed the company's turnaround. We have a strong business portfolio. How has Faurecia's sale of its exterior parts business to Plastic Omnium helped the company’s balance sheet? We sold our exterior parts business for a few reasons. First, the business was purely European and we could not expand it globally. Additionally, we couldn't see a way to add technology to it. We have sold assets that we couldn't grow or add technology to. We have to clearly define what our priorities are in terms of strategic moves, in such areas as the cockpit of the future and sustainable mobility. We have also told the market that we still have the potential to improve our profitability. In 2014, we said we would achieve an operating margin in 2016 between 4.5 percent and 5.0 percent and a minimum of 300 million euros of free cash flow. It is important because the market has decided that operating income is a key business indicator. If a supplier has a high operating income, it means that the supplier's execution is excellent or its technology content is high. Globally, the industry is doing quite well considering the volumes, the financial markets and raw material prices. Our customers' operating margin, on average, is between 5.0 percent and 8.0 percent. Their business models are largely based on car assembly and they have other sources of incomes such as car financing services. For suppliers, profit is largely derived from the added value of their businesses. What is the breakdown of your core business groups and how do they vary in size? We now have three business groups: seats, emission controls and interiors. Each represents about one-third of our sales. The geographical split in our sales is 50 percent in Europe, 30 percent in North America, and a little less than 20 percent in Asia. Our main customers are Volkswagen Group, which accounts for 20 percent of our sales, and Ford at 17 percent. Renault-Nissan and PSA each represent 13 percent of sales. For Tesla, we offer seat mechanisms and will become a major interior supplier. How has Brexit affected Faurecia? In the UK we are insulated because our production is used to make UK-built cars. The future will depend on the strategy of the automakers, even the UK-based ones, which will need to decide whether to continue to invest in the UK or look to better balance their cost base by investing in the eurozone. For automakers exporting UK-produced cars to the EU and worldwide, the devaluation of the pound is good, even if the parts they buy in euros are more expensive. For automakers that are selling components to the UK that are imported from the Eurozone [Brexit] is more of an issue.